Bill Reichenbach | McGinty Music, LLC. Bill Reichenbach started his jazz playing career while still in high school by playing with various bands in the Washington, D.C. area. He also sat in with his father’s group at the famous Georgetown club “Blues Alley” where he played with artists such as Zoot Simms, Al Cohn, Clark Terry, Urbie Green, Milt Jackson and others. While studying with Emory Remington at the Eastman School of Music in Rochester, N.Y., Bill played with many other jazz artists. He was also the featured jazz trombonist with the Eastman Jazz Ensemble. After graduation, Bill joined the Buddy Rich Band and was immediately featured because of his ability to play jazz on the bass trombone. In 1975, Bill moved to Los Angeles where he started playing the jazz tenor trombone chair in Toshiko Akiyoshi’s big band. At the same time, Bill was also the solo jazz trombone player on Don Menza’s big band. As a studio player, Bill has played on about 1,000 records, 700 motion pictures, and countless TV shows and jingles. Bill’s jazz quartet album featuring Peter Erskine on drums, Jimmy Johnson on bass, and Biff Hannon on piano, reached number 10 on the national jazz radio play lists. 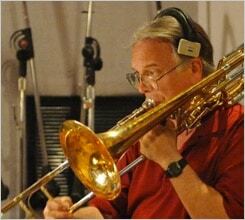 Bill has recorded three albums with Mike Davis—Bonetown, Brass Nation and New Brass. Bill has also recorded with Quincy Jones, Barbra Streisand, Michael Jackson, Elton John, Toto, The Yellowjackets, Seawind, Frank Sinatra, Tony Bennett, David Foster, Aretha Franklin, Al Jarreau, Earth Wind and Fire, Dr. John, Arrowsmith and Ray Charles. Bill was a featured artist and clinician at the 1997 International Trombone Festival in Urbana, Illinois and the 2000 International Trombone Festival in Utrecht, Holland. As a writer and arranger, Bill has worked on records for Michael Jackson, Quincy Jones, Aretha Franklin, Dr. John, Diana Ross and others. He has arranged many HBO Special Themes and composed the theme for the HBO One Night Stand comedy show. Bill also composed the theme for Fox’s animated series Peter Pan & the Pirates as well as much of the underscoring. Bill composed the main title for a series of Kurt Vonnegut stories called Welcome to the Monkey House for Showtime. A top-notch studio musician, Bill Reichenbach occasionally emerges from the commercial music world to play jazz. His father (also named Bill Reichenbach) was Charlie Byrd’s regular drummer from 1962-73.